Borough Market is in Southwark about 100 metres south of London Bridge. This covered market has a well-deserved reputation as a gourmet’s delight. Fresh produce from throughout the British Isles and across Europe is beautifully and temptingly displayed. Many of the stalls offer tastings to further tempt you to buy. Some of the best quality meat, fish, game, cheese, fruit and vegetables in London, if not in Europe, can be purchased here, but be warned, at prices to match! The market also has traders who specialise in artisan chocolates, truffles, hams, spices, breadand cakes to name just a few. Borough is now a major tourist attraction, and can get very crowded, it is also heavily frequented by film and TV crews, so if you have serious shopping to do try to get there early. As far back as 1014, and very likely earlier, London Bridge was frequented by traders selling fish, grain, vegetables and livestock. 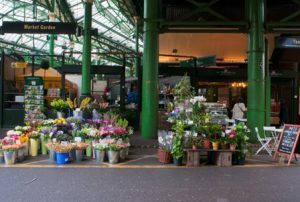 In the 13th century traders were relocated to what is now Borough High Street and the market, now known as Borough Market, has existed there ever since. In 1755, the market was closed by Parliament, but a group of Southwark residents raised £6,000 to buy a patch of land known locally as The Triangle, once the churchyard of St Margaret’s, and reopened the market. The Triangle is still at the heart of the market today.